If you are recording audio and notice that your recordings are not fully placed where they should be you are probably experiencing a recording latency. The studio is using a default value for compensation but you can get even better results! Soundation Chrome Studio introduces a new way to compensate for the latency that occurs when recording with external devices. 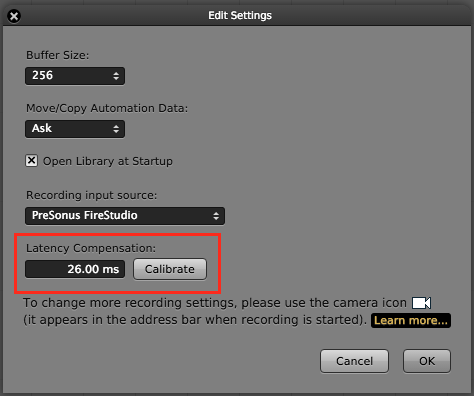 Running our calibration test will determine how much the studio should compensate for the latency introduced by your specific system. This will help the studio to more accurately position your recorded clips. Find the test under Settings - Edit Settings in the studio. Before running the test make sure your computer is using the Input and Output devices you wish to use with Soundation. Also make sure you have your "input source" selected in Soundation Studio and volume for your microphone turned up. If you have everything set up you can now click the Calibrate button and you should see this pop-up window. Follow the instructions. How you perform this test can vary on the equipment you use. If you are using an external microphone, put it next to and aim it at your speaker. Then start the test. You can also use your headphones for this test by putting the microphone to one of your headphone speakers instead. 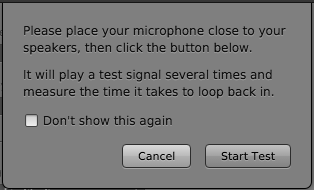 If you are using a laptop with its built in microphone you can just start the test or you can put a speaker or headphone speaker close to the built-in laptop microphone. You can also manually adjust the amount latency compensation by typing in the numbers you want or by click-dragging the numbers up and down.